Jakarta Regional Leadership Communication Forum (Forkopimda) continues to make synergies and collaborations to anticipate floods in the capital.
" There must be anticipatory steps in detail"
"There are 13 rivers flowing in Jakarta. There must be anticipatory steps in detail," expressed Jakarta Governor, Anies Baswedan when he became an inspector for a ceremony of 2018/2019 rainy seasons responsive, at the Polda Metro Jaya Traffic Directorate Promoter Field, Friday (11/16). Today is the first step of the Forkopimda ranks in anticipating flooding. "All elements must contribute in anticipating the threat of flooding. I express my appreciation to all the related ranks," he told. There are three guidelines that must be done in dealing with disasters in the capital that is Alert, Response, and Support. "Alert means we are alert to the worst possibilities, Response means there is a quick response in handling, and Support is all elements united to help those affected by the disaster," he explained. Meanwhile, Polda Metro Jaya Chief, Ir. Gen. Idham Aziz added that around 7,000 personnel have been prepared from Jakarta Provincial Government, Polda Metro Jaya, and Kodam Jaya. 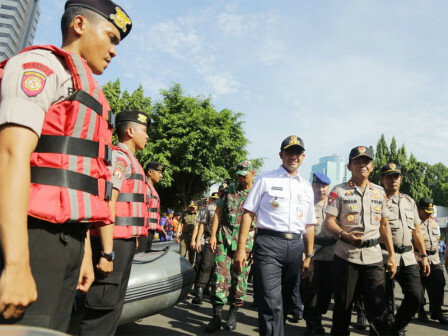 "Besides taskforce, there is also 13 units of sub-taskforce at the resort police level along with the Military Command (Kodam), as well as city government and district government," he stated. The ceremony itself was participated by Military Command Chief of staff Brig. Gen Joni Supriyanto; City Secretary, Saefullah; Jakarta BPBD Head, JUoan Royter Tampubolon; Jakarta Fire and Rescue Dept. Head, Subejo, and hundreds of joint personnel. Anies also directly checked the readiness of equipment and facilities and supporting infrastructure to support mobility in handling floods.